Because I recently discussed a blog post from March 2013, I was wondering what *I* was writing around the time. So here’s a blog post from that period. Please note that my opinions from six years ago do not necessarily reflect my current opinions. Contemporary atheists often assert that there is no need for them to provide arguments showing that religious claims are false. Rather, they say, the very lack of good arguments for religious claims provides a solid basis for rejecting them. The case against God is, as they frequently put it, the same as the case against Santa Claus, the Easter Bunny or the Tooth Fairy. This is what we might call the “no-arguments” argument for atheism. I take the side of atheists; I think theists have the burden of proof. This is not about giving atheists an unfair advantage in the debate, nor is it about making a “no-arguments” argument. In fact, I do not believe it is an advantage, fair or otherwise, at all. It’s simply about who takes which role. Something I now feel comfortable venting about, now that my PhD is over a year behind me, is their timekeeping practices. At some point in the middle of my PhD, they started requiring that we record hours. I (and other students) were pissed off about this, because we weren’t being paid by the hour, we were on fixed salaries. Being salaried has the disadvantage that your employer pressures you to work long hours, because they know they don’t have to pay you overtime. Being paid by the hour is better, but has the disadvantage that you have to record hours. By making us record hours, while keeping us on fixed salaries, we were getting the worst of both worlds. Once we actually started recording hours, it was even more ridiculous than we initially thought. It was not possible to record accurate hours–the maximum number of hours I could record was about 20 hours per week. This was supposedly because I had a “50% appointment”, meaning that half of my time was devoted to my position as a research assistant, and the other half devoted to being a student. Which was not accurate by the way. I wasn’t taking any more classes at this point. 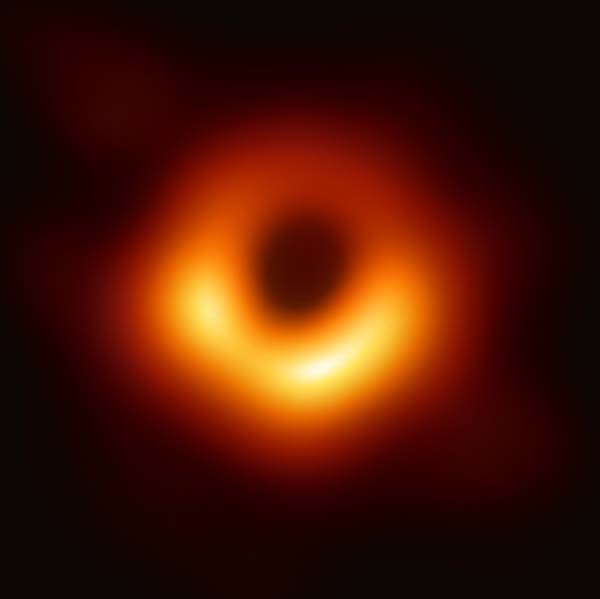 A few days ago, scientists announced the very first real image of a black hole (as opposed to one of those “artist’s conception” images that you see everywhere). This was a very nice surprise, because I was not aware any such project was underway, and I would have thought the obstacles were too great. The main problem with imaging black holes is that black holes are really far away. You would have to “zoom in and enhance” many many times to get the image above. Let’s compare it to other examples of extreme zooming. First, some local news. FTB got rid of ads! At some point we’re going to start asking for crowdfunding to cover server costs. This month, I published several articles on The Asexual Agenda. Most of it’s not legible to general audiences, but I would at least plug Ace Exclusionists and Gender. Ace exclusionists are an anti-ace Tumblr faction, our very own version of TERFs. Useless Vanity. Or Not. – Crip Dyke shares a personal narrative of how she became one of the early activists of transfeminism in the 90s, starting out in anti-domestic-violence activism. We are honored to have Crip Dyke here with us. Queer Tropes in Video Games (video) – It’s a three part series by Feminist Frequency! I think this follows the usual pattern of Feminist Frequency videos, of explaining points that are very well established, but are nonetheless important to explain because a lot of viewers aren’t necessarily familiar with the issue. Who was Natalie Reed? She was a writer for Skepchick in late 2011, one of the earliest writers to introduce people in the skeptical/atheist blogosphere to trans thought. She also led Skepchick’s sister blog, Queereka (no longer online), and then blogged on FreethoughtBlogs until early 2013. She disavowed the atheist/skeptical community around that time–she was years ahead of the rest of us. Natalie Reed is in fact still active on Twitter, although I understand that she has some major tensions with her earlier writing. I was a big fan of Natalie Reed for most of her brief, but prolific blogging career. It’s no secret that The Asexual Agenda, a group blog I launched in 2012, was inspired and modeled after Queereka. But I have to admit that I did not read a lot of Natalie’s later blogging, not because of any real disagreement, but simply because it was too long. I feel hypocritical making that complaint considering the length of my writing. And it’s unfortunate because “early” Natalie and “late” Natalie are somewhat at odds with each other, and I mostly just saw one side of that. So I’d like to reflect on some “late” Natalie. Specifically, this is about the very last article she ever wrote for FreethoughtBlogs, titled “Trans 101“, dated March 2013. Recently, ContraPoints released a video responding to Gender Critical Feminists (i.e. TERFs). I’d like to offer my own responses to the same TERF concerns, not really because I think TERF concerns deserve to be addressed at length, but because I believe in participatory learning. I also like to think that I’m adding a few useful points. Asking trans people “What even is gender?” is kind of like asking theft victims, “What even is property?” That is to say, it’s a really tough question that deserves a serious answer, and therefore should be asked in a different context where it’s not a transparent troll. Otherwise, don’t be surprised when you get reductive slogans like “man trapped in a woman’s body”. IMHO, a lot of gender, as it is commonly understood, seems to come down to snap judgments that we make about other people. Those snap judgments are based on appearance and voice, cross-referenced to the gendered customs of your culture. But snap judgments can also be “wrong”, suggesting that gender does not refer to appearance itself, but refers to an essence indicated by appearance. But the nature of the essence itself is unclear. 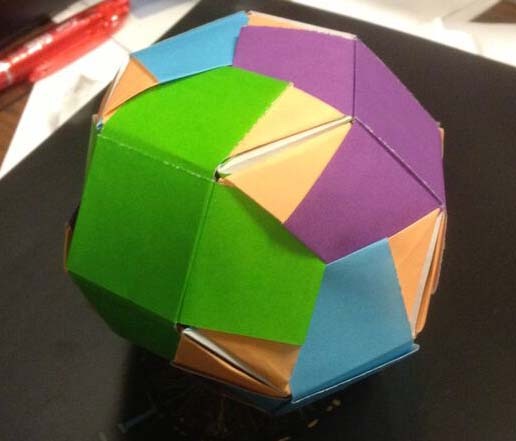 Truncated Octahedron, designed by me. I kept this on my office desk. Today’s model is one of my earliest original designs. This is a truncated octahedron, which is the shape you get when you take an octahedron, and chop off the 6 tips.